RAPID CITY S.D. — Finding a parking space in downtown Rapid City can be a challenge. But that could soon change. The city is planning on switching to a ‘pay to play’ system. 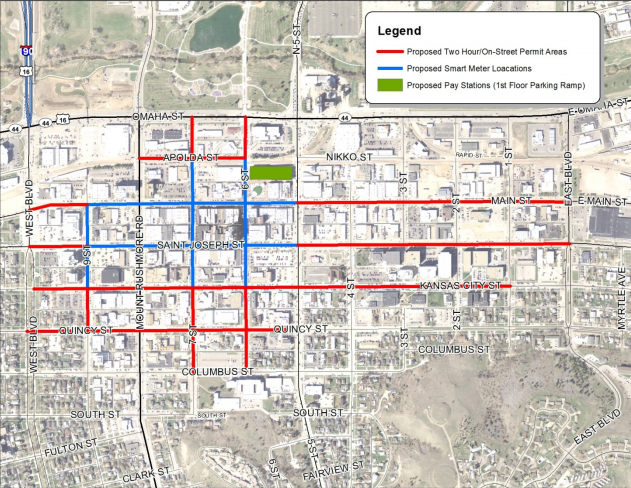 If the city gets its way, parking in downtown Rapid City will look drastically different next year. On Wednesday, the city’s Legal and Finance Committee approved a sweeping plan to revamp parking downtown. 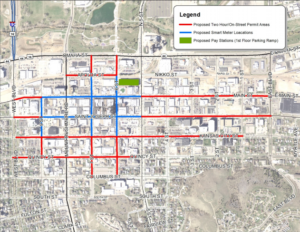 “These changes that we’re bringing forward really help us manage our parking more efficiently, and makes it much more convenient for the person who’s coming downtown to park,” said Sarah Hanzel, the long-range planner for Rapid City. The parking plan calls for two-hour limits for some spots downtown. The areas around the Hotel Alex Johnson will have digital parking meters accepting payment through a mobile app. The city also hopes to roll out on-street parking passes for people who work downtown. That way, they won’t have to disrupt their day by moving their car. But some business owners take issue with the plan, saying that by having 2-hours caps on parking in some spots downtown, it could limit their business. “For my business downtown, it doesn’t work, and it sure doesn’t give my customers an opportunity to stay downtown, go to the ice cream shop, go to the toy stop, do whatever they want to do on a beautiful summer day downtown,” said Curt Small the owner of the Elks Theatre. The plan also increases parking tickets for expired meters to $25. People who receive tickets will have seven days to appeal them to the downtown parking advisory board. The board is made up of seven people, made up of community members, and downtown business owners and workers. With the changes, city leaders hope to change the mentality of parking downtown. “Our hope is that the revenue collected from this point forward once the change occurs will be in fees instead of fines like it is today,” said Chief Karl Jegeris with the Rapid City Police Department. The plan is expected to bring in at least $2.5 million over the next five years. The measure will now move onto the Rapid City Common Council next Monday. If approved, the entire downtown parking plan will kick off on June 3. The downtown parking passes for businesses and workers will be available in May. For more information about the proposed plan, click here.